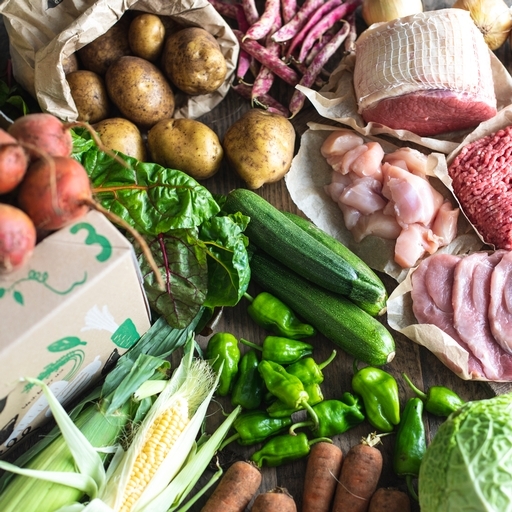 A large seasonal organic veg box plus 4 cuts of organic meat; great for families and keen cooks. It’s full to the brim with 10 portions of freshly picked veg, including the essentials of potatoes and carrots or onions, plus a selection of the best meat from our butchery. Contents change weekly to keep things interesting. Look out for asparagus in spring, romanesco in autumn, and winter squash, alongside prime steaks, minced beef, chicken, and the occasional roasting joint. Delivered free to your door, with seasonal recipes alongside.